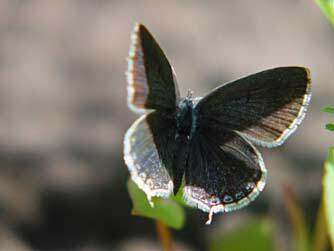 Western-tailed blue butterflies or Cupido (sometimes Everes) amyntula live in western, central and eastern Washington in undistrubed, moist habitats. These butterflies are adapted to rely only on legumes having large pods for host plants, such as peavine, vetch, milkvetch, and locoweed. Its caterpillars eat into its host pod, sealing the hole with silk, consume the legume seeds and overwinter in the pod. Butterflies take flight in spring and summer. 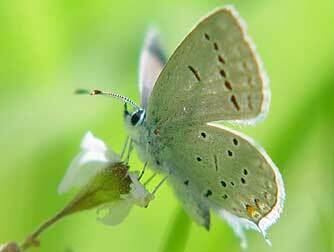 Tailed blues have a narrow tail and orange lunule on the hindwing, like a hairstreak butterfly-- a false head that fakes-out birds and boosts survival rate. 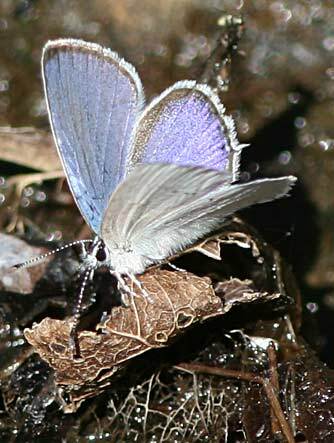 The upper wing surface of males is bright blue with a purple cast, while female dorsal wings are brown with some blue at the base. 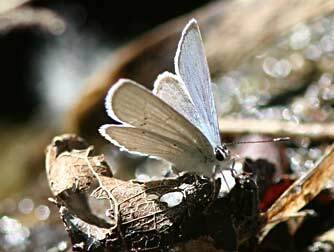 The ventral wing color of both male and female is white with slight spotting. 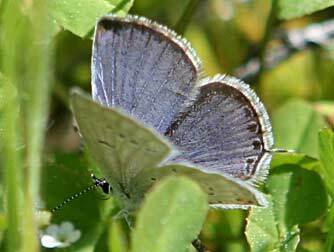 In comparison, the eastern-tailed blue butterfly has larger spots, more than one orange lunule at the tail, and a gray ventral wing color. Wingspan is 7/8 to 1-1/8 inch.